Is Our Higher Education Preparing The Youth For Tomorrow? In less than two years, India with more than 60 percent of its population in the working age group is set to become the youngest country in the world. India will have the potential and energy capable of bringing about an unprecedented change in society. This is a huge opportunity, but is our education system preparing the youth to channelize this energy and knowledge in the right direction? Since independence, the number of central and state universities has increased manifold making education accessible to every stratum of the society. The last two decades have seen an unprecedented transformation in higher education system in the country. Universities have sprung up countrywide to cater to the growing size of young population. Private educational institutes have mushroomed and are contributing significantly to the expansion of higher education in the country. India has the second largest higher education system in the world, where private universities increased from 36 percent in 2011 to 45 percent in 2017. At the same time, there are growing concerns about the quality of education and student outcomes in institutes of higher learning. As the economy and its industries grow and get more complex, and organizations grow more global and digital, the skills and attributes of tomorrows graduates need to shift dramatically. The core mission of academic institutions should shift from imparting textbook knowledge and focus more on empowering young people who will co-create the future. The focus should be on holistic learning that touches upon every aspect of a person's potential and inspires and transforms them. Every institute should develop a learning philosophy that is embedded in its curriculum which ensures that each student experiences the key pillars of a holistic education. Academic institutes must go beyond their core competencies of teaching and research and focus more on nurturing an innovation culture, engaging students and developing an environment for positive exchange of ideas. This can be built by multidisciplinary learning, collaboration, encouraging learners and faculty to explore new technologies and equipping institutes with lifelong learning skills. Groundbreaking ideas have to be channelized in the right direction and aligned with the education system so that the society benefits from the implementation of those pioneering concepts. Exposure to entrepreneurship and the incubation of new ideas and young businesses during one's college years can have a huge impact on the future of a learner. In this highly competitive environment, it is essential that students are equipped with special skill sets such as ideation, design thinking, problem-solving and are adept at applying those skills. The process of mentoring and apprenticeship plays a critical role in shaping a student's career. Although it is least discussed and emphasized upon, career mentoring should ideally start in the first year and should ideally be supported with a continuous assessment of a student's professional competencies along with providing personal support thereby enhancing a student's chances for success. To summarize, this is a very important stage in India's history and as Educators, we are writing about the future of our nation. The world is changing rapidly and creating a Lifelong Learner is key to optimizing this opportunity. With over twenty years of dynamic experience across corporate and academia, Nandita joined Pearl Academy in 2001 as a faculty in the School of Creative Business. Over the years, she has worked successfully at various positions within the academy. From being a faculty to heading corporate relations & marketing departments, Nandita has driven multiple initiatives. 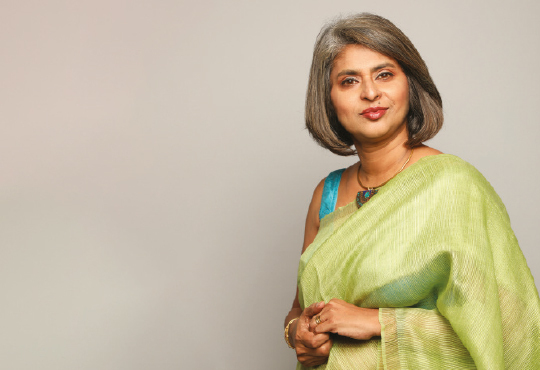 Nandita is a member of the CII National Committee on Design and is also a member of Executive Committee, IFFTI – International Foundation of Fashion Technology Institutes.